POLICE Lance Corporal Mohamed Syarul Azman Mahen’s dream was to become a professional footballer but he ended up as a champion bodybuilder instead. The 37-year-old was a former national youth footballer, who played alongside former national strikers such as Azman Adnan, Paul Raj and Ramachandran. He was set to go professional when fate intervened. Commanding the left back position in the national Under-19 squad which featured in the Asian Youth Football championship in China 20 years ago, Mohd Syarul was prematurely forced to hang up his boots due to ligament danage on both knees. But like a true sportsman, he never gave up. Determined to undergo rehabilitation process, he began spending countless hours in the gymnasium and “accidentally” stumbled onto the world of body building. Some gymnasium officials who spotted his impressive physique, coaxed him into taking up bodybuilding seriously and he had never looked back since. On Sunday, the father of two reaped the fruits of his 11-year labour when he was crowned the new Mr Malaysia in Penang. Before a packed ballroom at Hotel Vistana filled with guests occupying 32 dinner tables and standing spectators, the well built Mohd Syarul not only won his fourth light weight title in five years, but also the overall title. “This is simply unbelievable as I never thought that I would be able to get the better of the contestants from both the light heavy and heavyweight categories,” said an excited Mohd Syarul after his crowning on Sunday. Before this, Mohd Syarul had failed in his three attempts. Crowned a light weight champion for two straight years in Penang 2006 and then in Sabah the following year, Mohd Syarul took a year’s break to do some soul searching and to develop his body further. Even after successfully regaining his light weight title last year, the overall crown still proved elusive. But the moment a helping hand came from reigning Mr Universe Sazali Samad, who is also another police product, Mohd Syarul’s pursuit for glory took a new twist. “It is only right that I attribute my success to Sazali. If not for his guidance, my hope of winning the overall crown would have still been a distant dream,” said Mohd Syarul, who also thanked Othman Yahaya, Ghazali Yunus and Datuk D. Ramesh (Pelita) for their help. “Sazali was most helpful in enlightening me on the sort of training to put in and the type of diet to stay in the right shape. 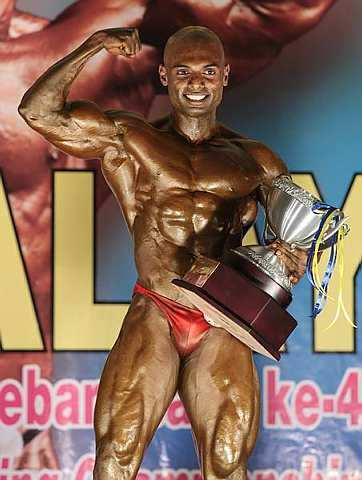 Mohd Syarul’s success earned him a ticket to the Asian Bodybuilding Championship in Teheran on Aug 3. The Malaysian Body-building Association have also entered him for the Asian Bodybuilding Classic, which will be held concurrently with the Asian championship. Being the first Malaysian pitting for honours in the Classic, Mohd Syarul is quietly hoping to return home with a grand double.